Hurricanes are a terrifying force of nature. If you live in an area that could be affected by one, you must take steps to prepare well in advance. Read on for tips to keep your family safe and sound during the storm, and learn what to do with your pets during a hurricane. Hurricane Season officially begins on June 1 and ends on November 30. However, storms have occasionally developed prior to the season start, so it’s a perfect time to mentally prepare. National Hurricane Center (https://www.nhc.noaa.gov) is a terrific resource to keep up on hurricane and tropical storm development. When a storm is announced that may potentially impact your area, it’s time to take basic precautions. This is the ideal time to stock up on extra food and water for your family and your pets. Secure extra amounts of any necessary medications your pet requires. It may be a few days/weeks before veterinary offices open after the storm, and you don’t want to run out. Even if the storm ends up not affecting you after all, you’ll use it, so it’s best to be prepared! You should also make sure your pet is up to date on vaccinations in case a mandatory evacuation is necessary, as pet-friendly storm shelters are limited and often require current vaccination records. Also stock up on ointments, bandages, and basic first aid. This is also a great time to prep an indoor potty station. Pee pads work well for some dogs, while others, especially larger dogs, may struggle with using them. A great option is to use a small kiddie pool! Pick up a few squares of sod/grass from your local store, or if necessary, cut some out of your yard. Place the grass in the kiddie pool to help encourage them to potty inside during the hurricane. In the hours before the storm, it gets a little hectic. Set aside time to play with your dog and take them on a nice, lengthy walk to tire out your pup as much as possible. The physical activity will help keep them from being bored and anxious during the storm, which is a difficult and stressful combination to deal with. If you’re evacuating, PLEASE bring your pet. If it’s not safe for you, it isn’t safe for them. I cannot stress that enough. There are always better options than leaving your pet, such as checking with your local news for pet-friendly shelters or hotels outside evacuation zones. If your area isn’t under mandatory evacuations, and you’re planning to ride out the storm at home, select a windowless area like a closet or hallway to take shelter. Set up your pet’s crate there, along with a mattress on the floor for family members to be comfortable. Track the hurricane’s progress and make a final outdoors potty trip before winds/rain pick up. You and your pup don’t want to get caught in a sudden strong wind gust! Once the storm begins, settle in your safe area with plenty of comfort items - toys, treats, puzzles, blankets, etc. Block off the hallway or keep closet doors closed to keep your dog close so they don’t zoom around the house during the storm. Also keep their leash/harness near, along with food/water bowl. Have their potty area accessible, along with poop bags and cleaning supplies to minimize messes. Avoid going out during the eye of the storm, as they can be surprisingly brief and winds could pick back up suddenly. Plus, there could be damage that could injure your dog. Phew, the storm is over! Before letting your dog out, walk the yard or potty route for safety. Look for any downed power lines, holes in the fence, debris that can cut their feet, etc. Once you’ve cleared an area for them, you can take them to potty safely. 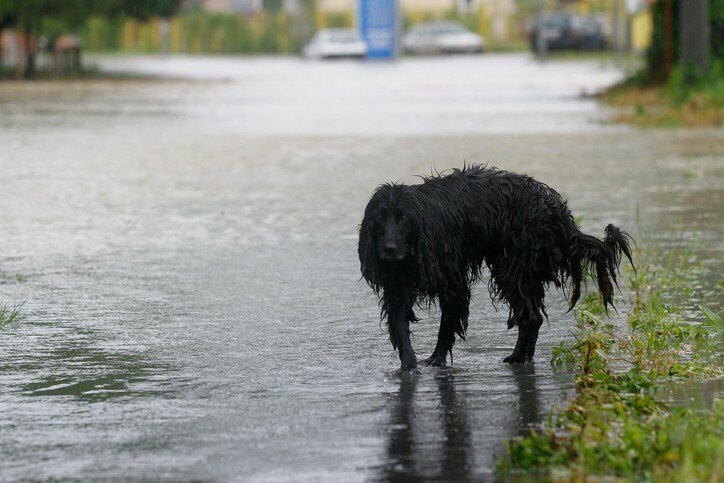 Have you had to ride out a major storm with your dog? Share any tips you used to keep them calm below! Hi there! 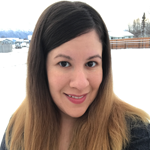 I’m Natasha Thompson, creator of Om Shanti Pups, a health and holistic lifestyle dog blog. I love puppies (of all ages! ), yoga, and dog rescue. I live all the way up in Alaska with my husband Dan and our two crazy four-year-old Puerto Rican sato street rescues Roxy & Rico. Find us on Instagram & Twitter @OmShantiPups, or visit https://OmShantiPups.com.